LEGO is awesome. LEGO robotics is awesomer. But the LEGO Renewable Energy Education Set is the awesomest. 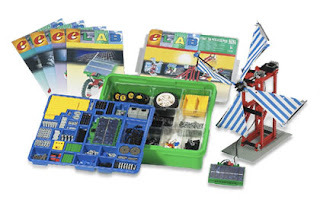 According to the LEGO site, the set includes a solar panel, a flux capacitor and two motors and is intended to provide a teaching opportunity with kids. Instructions include windmill, water mill or solar-powered Ferris wheel and more. It "helps students investigate the concepts of energy, energy sources, electricity and the environment by building models." Luvit! I w00t!!! Um, for the Dude, of course.